One of my favorite things about winter is time off from work. Not that I mind guiding, of course, but it is nice to get a little fishing in for myself on occasion. 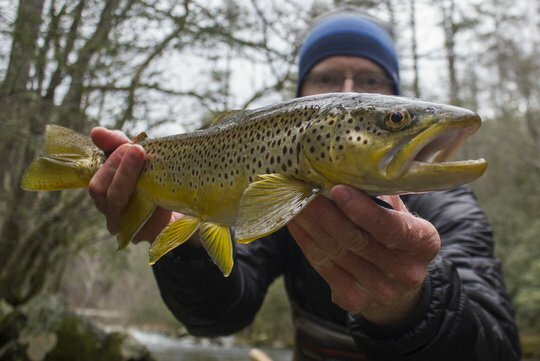 Lately I've been privileged to spend more time on the water than I deserve including trips on tailwaters like the Caney Fork and South Holston as well as fishing in the Great Smoky Mountains National Park. The best thing about this streak of fishing trips is that they have all been successful. Now, success can be a difficult thing to understand. Defining success becomes even harder when multiple anglers all have their input, so let me explain my idea of success when I'm the one holding the fly rod. Success is, first and foremost, spending time out in nature. Catching a fish would be nice as well. After all, I'm out fishing for more than just the scenery. That said, I don't need huge numbers these days. I don't really even need big fish although those are always nice. Secretly, most anglers hope for big fish so they can wow their friends with stories of their fishing prowess. I don't know about wowing others, but I will say once again that big fish are nice to see. The thing about big fish, though, is that they get kind of stressful. When you have a big fish on the end of the line, all of your nerves and muscles bunch up. In the end, it can take days to unwind from a particularly hefty specimen. Needless to say, catching too many wall hangers could take its toll. The absolute best fish to catch are those that are larger than normal, but not so large as to cause you to completely lose your mind. Larger than normal because, let's admit, they look good in the picture if you are into that sort of thing. I take pictures to help me remember the fish later. I'm starting to realize that my good memory may not last forever, but hopefully those pictures will help jog my memories if it comes to that. Over the last two or three weeks, I've been blessed to catch four of those memorable fish. On each fishing trip, only a handful of fish were caught. On at least one, I know for sure that the memorable fish was the only fish. Somehow that helps those memories become a little clearer. The hazy memories usually come from the days where I quit counting how many 18+ inch fish I caught oddly enough. Anyway, so as I was saying, I've been on a bit of a roll lately, and I'll gladly take it. Any serious angler knows that luck can turn suddenly, so it is usually wise to ride a winning streak hard. The first good fish came from up in the Smokies, the next two from a couple of tailwaters, and the last one was back in the Smokies again. Let me tell you about that last one. It happened this past Thursday. A weather system had moved through Wednesday night into Thursday morning dropping snow in the higher elevations. The morning after the storm was cloudy, and I hoped it would stay that way. Fishing for brown trout is always tough, but clouds do give an angler an edge even if it is a flimsy one at best. My usual early morning responsibilities evaporated and I was suddenly free to head for the mountains earlier than I anticipated. I was not too far down Interstate 40 when I noticed the breaks in the clouds to my east; definitely not a good sign for chasing brown trout. The openings in the clouds became more defined as I got closer to Knoxville, but mercifully started to fill back in by the time I was passing the Knoxville airport. My intended short stop at Little River Outfitters stretched longer than I wanted but that was my own fault. They have set up a tying table to tie flies for worthy causes. When Daniel told me I could tie the first fly, it was an opportunity I could not pass up. I quickly cranked out a bead head Pheasant Tail nymph, something I'll probably do each time I visit now. This is definitely a fun idea so check it out when you are in the shop next time! Finally, after grabbing some white tying thread (there is a hint there about my streamers, but of course not about where that color is being fished), I finally said my good byes and headed into the Park. It was a cold blustery day. The white on the hills above town told me that snow had fallen in the higher elevations and probably still was in places. The clouds were just thick enough to give me some motivation, but the cold day was giving me second thoughts. Just getting out to see the mountains was enjoyable enough. Of course, I wouldn't be writing this story if I just drove around looking at the water. By now it should be obvious that I did indeed go fishing. My streamer rod was still rigged up from my last tailwater float. While that combo probably would have worked, I decided to change flies. At the last second, inspiration struck and I tied on a sculpin pattern to the short leader at the end of my full sinking line. That is always a good idea if brown trout are around as long as the water you are fishing also contains sculpins. The second run I fished produced two really good hard tugs, but neither fish found the hook apparently. The first hit was particularly gratifying as I watched the fish come flying out of calm water to chase the streamer. Moving slowly down the river, I fished another couple of runs without any hits. One of those was a particularly good spot where I had caught my first fish of 2017. When it didn't produce, I decided to go looking elsewhere. Still more or less uninspired as to where I wanted to fish, I decided to just explore. That is almost always a recipe for success in my experience. Early in my exploration I found quite a few fish. In fact, I had more brown trout chasing streamers than I can recall on just about any other fishing trip. Still, the fish either wouldn't commit or couldn't find the hook. Both problems left me searching for that one fish. There is probably a good metaphor there as well, but I don't feel like unpacking it tonight. Finally, I remembered where I caught the nice fish that had started this whole string of good luck a couple of weeks back. The beauty of catch and release is the chance to go and see if old friends are home so that is what I did. Remember exactly where the last fish had come from helped a lot. I worked my way into the run very cautiously, knowing that it is far too easy to blow a nice fish. A couple of drive by flashes from smaller fish got me excited. When I finally threw to that one spot, I strongly suspected I would be seeing that nice golden flash again. Sure enough, the brown charged, swirled once, then twice before knocking the streamer silly. It was all I could do to not pull the fly out with a massive hook set. Instead, I started twitching the fly like I imagined a disoriented sculpin would be doing. Miraculously, it worked. Seriously. When it all comes together, and I should point out that this is not the norm, I'm left wondering: why can't I get myself together and do everything right all the other times? When a nice fish is in the net however, I leave the wondering until after taking pictures and generally admiring the fish. They deserve my respect which looks like a very fast picture and quick release. The fish posed beautifully and then I was left to wonder about why everything worked this time. Somehow I couldn't quite make sense of everything, but was left to realize that I'm definitely on a roll and better enjoy it while it lasts. A streak like this won't last forever. In fact, the clouds broke just after catching this fish and the streamer bite went dead in a hurry. For now, I'll be watching the forecast waiting for another cloudy day.